AED classes in Michigan take just a few short hours to complete, but can make all the difference to those in need. After all, the average response time for first responders once 911 is called is 8-12 minutes. For each minute defibrillation is delayed, the chance of survival reduces by approximately 10%. Fortunately, with online, in-person, or blended AED training from the American Red Cross, you can learn the skills that can help save a life. 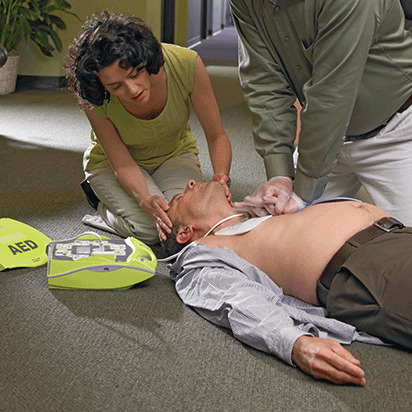 At the Red Cross, AED classes in Michigan will prepare you to provide life-saving care during sudden cardiac arrest. For those taking in-person or Simulation Learning classes, you'll receive world-class training from experienced, certified instructors who can help you understand why, when and how to use an AED, then you'll receive hands-on training to help you gain the skills and confidence to use the device. For those enrolled in an online-only class, you'll receive the same exceptional instruction, but you'll also perform a number of online activities to test your knowledge and become comfortable with the material. Sign up for an AED class that suits your schedule, and your learning style. After successfully completing your Red Cross AED training in Michigan, your certification credentials will be valid for two years. During this time you'll have access to online refresher materials, and as your certification's expiration date nears, you'll have the option to take an abbreviated AED renewal class. This way, you can stay up to date on the latest information and techniques, and extend your certification by two more years. If you have a Michigan AED certification that's within 30 days of its expiration date, you can register for an abbreviated in-person or blended Simulation Learning class. Both types of classes allow you to learn the updated science and best practices for when and how to use AED devices – and allow you to demonstrate your skills to a certified instructor. At the American Red Cross we not only offer AED training in Michigan, but we offer a wide range of health and safety classes throughout the state. In addition, we work as part of a global humanitarian network that responds to emergencies and provides training in more than 180 countries worldwide. In order to ensure that those we train are kept apprised of the latest information and techniques, our courses and materials are developed by experts in the field and reviewed by the Red Cross Scientific Advisory Council. At the Red Cross we believe in empowering you to provide care when it's needed most. In order to make sure that you receive the training you need to confidently help during times of crisis, all Red Cross classes, including our AED classes in Michigan, are developed under the guidance of, and reviewed by, the Red Cross Scientific Advisory Council. Comprised of more than 50 nationally-recognized medical, scientific, and academic experts, the Council works to ensure that Red Cross programs and materials are not only based on the best science available, but that they're also effective and easy to understand.